Private Tours offer an in-depth experience of Manitoga’s architecture and landscape and allow special access. Visits can be arranged by appointment Tuesday through Thursday at least 2 weeks in advance for a minimum of 2 and up to 6 participants. Call the Manitoga office at 845-424-3812 to reserve, or email us. Private tours are subject to staff availability. Dragon Rock House & Studio Tour lasts one hour and provides a focused look at the architecture with terrace views of the landscape, excluding the moderate hike around the Quarry Pool Path. 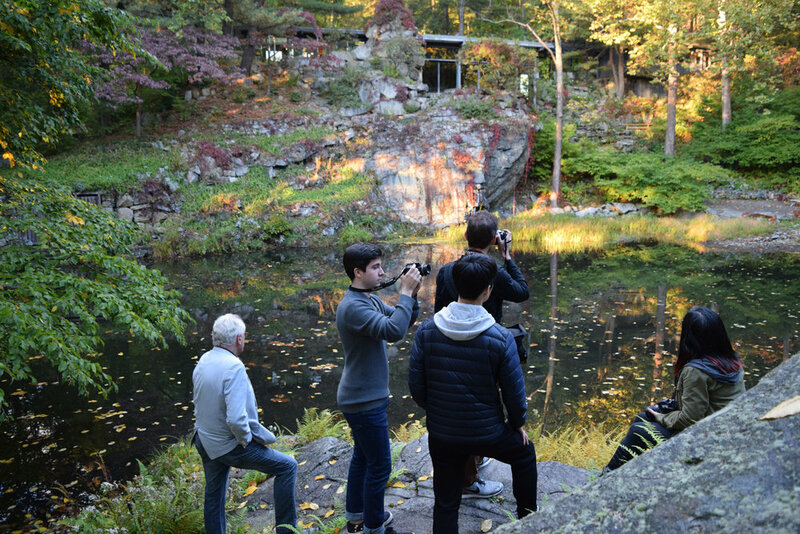 The Immersive House, Studio & Landscape Tour lasts 90 minutes and provides an intimate experience of the landscape and architecture with special access to the lower Quarry Pool area, including Dragon Rock’s Nose and the Beach Room. Please note this tour includes a moderate hike, several bridge crossings with no handrails and a flight of 40 stone steps. Tours are conducted rain or shine. Please wear sensible walking shoes and dress for weather. Visitors must be able to negotiate uneven ground. Please note that the landscape portion of the tour is a moderate hike.